This advanced color Panaboard supports a variety of business situations with a wide range of functions. You can save the information written on the board onto a PC, an SD memory card, or USB flash memory, and distribute it as electronic data to your colleagues from a PC, all in color. Operation is done using easy-to-understand icons. 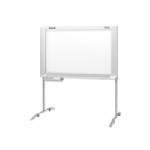 Panaboard gives you maximum power in presentations and conferences.